Confident she'd figured out the rare illness that afflicted her and her family, a young woman set out to convince her doctors--before it was too late. Opening photo: Janet, 8, Aaron, 6, and Jill, 10, on the first day of school, 1985. "Witches' Fingers Grab My Legs"
I feel like a spy who has gained entrance to a top-secret facility, as I await the start of an informal research meeting at Johns Hopkins. Around the table on this summer morning sit a half-dozen scientists, each armed with a pile of papers that represents the culmination of years of research and data. I sense their sideways glances as I awkwardly circle the table and draw a chair up beside them. I don't resent their curiosity, I welcome it. I scan a newly published research article describing the 53 people in the world who share my diagnosis of autosomal dominant Emery-Dreifuss muscular dystrophy (AD-EDMD). I am comforted to learn that one to two new cases are being discovered each week, yet I feel alone as I recognize that my family may be the only one in the United States affected with AD-EDMD. I contemplate the stories hidden beneath the cumbersome text. Black circles and squares. Lives stretched to the limits of human endurance, now reduced to geometric simplicity. I trace my finger over the description of a young woman, similar to myself. I think about this person living far away, yet in a strange way, inhabiting the same body as mine. I wonder what she does for a living, who she loves, and what her family is like. But, most of all, I long to meet her someday. I imagine traveling to a small cafe in a distant country and out of the crowd of bustling patrons, eyeing someone with the same waddling gait as myself. Oblivious to the passage of time, I would speak endlessly to her like a woman reunited with a child given up for adoption. But as I strum my fingers over the brief description, the text becomes all too real. The age, the surgical history, the pattern of muscle weakness ... I finally realize I am looking at a description of myself. I took my first steps at my 1-year-old birthday party in 1975. Though my parents described me as delicate and feminine from infancy, my early milestones were unremarkable. As a toddler, my personality seemed made to match my slim build--I preferred dresses to all other choices in my closet, even insisting on a dress to play in the backyard sandbox. My slight build was initially the source of humor as my mother fondly recalled the afternoon she heard a gentle plea of "Help me! Help me!" echo through the house. She rushed to the bathroom to find the toilet bowl had engulfed my torso and limbs, yielding just a head peering out from the porcelain bowl, with patent leather shoes pressed against my ears. Her questions lingered as she watched my sister and me standing side by side as we prepared for a bath. Despite being 26 months my junior, my sister's contours were more rounded and full. My mother shared her concerns with the pediatrician but was assured I was simply a petite child and a picky eater. I was baffled by my younger sister, Janet. I was the oldest and proud to boast of that fact. While posing for pictures, I'd duck behind her and perch my head atop hers, smiling through clenched teeth. A head taller, that's what I thought I should be. I learned that my kicks and punches posed no real threat to her bulky form. As she lumbered toward my wooden block towns, my clenched fingers dug into her skin, yielding a red-tinged crescent often present on her forehead in early family photos. It was at the age of 3 that my prophetic imaginary friend made his appearance. "Murphy broke his legs. Poor Murphy!" I explained. "Murphy had two casts on his legs," I'd say as I gestured to his invisible legs. Two hundred yards. Five falls. Something was terribly wrong. A phone call from my preschool teacher confirmed my mother's fears. The creation of Murphy was soon accompanied by other oddities. While walking long distances, I'd often cry to be carried. My mother recalls losing sight of me one afternoon in Target. After frantically searching the store, she found me curled up asleep on the linoleum floor inside a round clothing rack. On Sunday mornings and school days I was known to flop back into bed, lying motionless atop my newly made bed after dressing and eating breakfast. Even the brief walk from my friend's house to my own was accompanied by protest. "Witches' fingers grab my legs!" I'd insist, as I stumbled numerous times over the scattered leaves and twigs. My mother eyed the short distance behind us. Two hundred yards. Five falls. Something was terribly wrong. A phone call from my preschool teacher confirmed her fears. "We never see Jill run, she just stands and watches the other children and she often falls while walking in the hallway," she explained to my mother that afternoon. The idea that a genetic component was causing my muscle weakness was rebuked when my mother addressed her concerns once again in the pediatrician's office. "Girls can't have muscular dystrophy, only boys," the nurse mistakenly advised her. But my pediatrician eyed my curious waddle. His suspicions grew as he recognized a positive "Gower's sign"--or the use of the hands to brace the body when attempting to rise from the ground. "That's my handle," I insisted, as I gripped my knee time and time again when asked to rise from the floor. Though my muscle weakness was characteristic of muscular dystrophy, my tiny build was not. He explained that muscular dystrophy is counterintuitive. One would expect to see muscles wasting away, but this is not usually the case. Instead, big, lazy, often enlarged muscles, especially the calves, are a prominent feature. A trip to the Mayo Clinic, at age 4, confirmed a diagnosis of muscular dystrophy. We learned that it's an incurable genetic disorder of skeletal and sometimes cardiac muscle, characterized by progressive muscle weakness, which may or may not be life-threatening. Initial symptoms may include frequent falls and awkward gait in childhood, though some forms of MD may not develop until adolescence or adulthood. The diagnosis was based on an elevation of creatine kinase in my bloodstream. Creatine kinase, an enzyme primarily localized within healthy muscle tissue, leaks into the bloodstream as diseased muscle tissue breaks down; thus, its elevation in the blood is indicative of muscular dystrophy. However, a definitive diagnosis from among the more than 40 types of neuromuscular disorders remained elusive. I shared my own theory with my mother as we drove home from the shoe store one day. "We have to go back!" I insisted, holding my new tennis shoe in the air. "I have to have red shoes, not blue ones!" "But blue goes better with the clothes in your closet," she insisted. "No, red is the color of fire and fire is fast, so if I wear red, then I can be fast!" She opened her mouth to explain, but instead turned the car around. Later that day, she caught a glimpse of me on top of the picnic table, dressed in faded red corduroys and my new red raincoat and shoes. As I rocked on the edge, preparing to jump off, I closed my eyes and pictured myself running for the first time. Each August during my childhood, my family piled into the station wagon for my annual visit from our hometown of Des Moines, to the Mayo Clinic. I became very aware of the fact that the doctors didn't carry a thick folder for Janet. My sister's presence made me especially angry as I returned from lengthy appointments to find her sprawled across the waiting room chairs with her dolls and toys. The lengthy visits proved taxing for Janet's patience as well, so as the years passed, I waved goodbye to her from the backseat of the car; she waved back from our grandparents' porch, clutching her favorite green plastic suitcase. When I was 7, my heel cords contracted--a common occurrence in muscular dystrophy--causing my feet to freeze in a tiptoe position. I required surgery to lengthen the cords. Once again, I traveled to Mayo and my sister stayed behind with my grandparents. As I lay in the hospital bed recovering from surgery, my mom accidentally let it slip that my dad had taken Janet to see the movie E.T. Initially inconsolable, I was finally comforted by the addition of a stuffed E.T. to the nightstand beside me and pictures of the ugly gray extraterrestrial plastered about the stark white walls of my hospital room. As I returned home with my legs in two bulky walking casts, I was greeted by Janet, with her arm in a sling fashioned from a doll blanket. "I have to wear glasses and get allergy shots," she said. "It's not the same," I shot back. 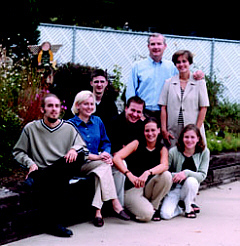 The Dopf family gathers on Labor Day 2000: (Seated from left) Aaron, Jill, Bobby, brother-in-law Ben, Betsy, and Janet. Standing: parents Robert and Mary. In the eighth grade, as part of my Human Growth and Development class, we watched a slide show of genetic abnormalities. A chorus of snickers grew louder as a series of twisted bodies and empty faces was displayed. The final slide depicted a teenage boy with clumps of acne surrounding jagged teeth jutting from his misshapen lips; a rectangular black bar covered his eyes. The snickers exploded into raucous laughter as several students raised backpacks and books over their eyes. "If I looked like that I'd shoot myself in the head!" shrieked a voice from behind me. The nervous teacher dashed across the room and attempted to erase the disruptive image by turning on the overhead lights, but the boy's pale grin still loomed at the front of the room. Without bothering to silence the laughter or seize the moment to discuss the situation sensitively, she silenced the disruption by tugging the cord from the wall socket and erasing the image from view. I learned to hide myself. Returning home to my closet, I pushed my short skirts and shorts to the back. At the mall, I passed by racks of sundresses with spaghetti straps that I would have preferred, settling instead for long-sleeved shirts and ankle-length skirts. I desperately tried to gain weight, keeping journals of my caloric intake and drinking endless cartons of high calorie supplements. Yet as a 25-year-old today, I'm still able to slide my junior high jeans over my narrow hips, and I remain a non-existent plot on the grid on the back of the pantyhose package. As I completed my first year of college at Drake University, my introductory genetics professor arranged an internship with Dr. Thomas Horiagon at the Human Gene Therapy Research Institute in Des Moines, Iowa. Through my studies there, the once baffling world of DNA came to life as I found myself able to follow the articles in medical journals. Armed with my new vocabulary, I transferred to Iowa State University to pursue a degree in genetics and searched the Internet for clues. I was inspired by the film Lorenzo's Oil, in which a father and mother desperately search for, and eventually discover, a cure for their son's debilitating neurological disorder. I thought of this movie often as I spent more and more time in the dark, musty tiers of the ISU library. I wondered if someday I, too, would occupy a dark circle on a genetic chart cataloged on a dusty library shelf. In the library, I stumbled upon photographs of people with Emery-Dreifuss muscular dystrophy. Though a rare disorder, typically seen only in males, I could readily identify with some of the bizarre symptoms unique to this form of MD, which included contractures of the Achilles tendons, elbows, and neck. A contracture differs from a muscle spasm in that it involves a permanent shortening of the muscle or tendon, which results in a loss of motion. Imagine if the musculature of a child was stretched over an adult skeletal frame--elbows frozen in mid-flexion, like a cowboy poised to withdraw a gun from a holster, and shortened neck muscles preventing even minimal bowing of the head. I was encouraged to learn that the gene for the disease was identified by a team of scientists in Pavia, Italy, in 1994. Although initial references described only male EDMD cases, I uncovered reports suggesting the possibility of a second, much rarer gene, affecting males and females equally, though perhaps fewer than 100 such cases had been described to date. I wondered if the Italian team would be interested in studying my family in the search for the AD-EDMD gene. Clutching an armful of research articles related to EDMD, I suggested this possibility during my yearly neurological exam in the fall of 1995, hoping my doctor would share my enthusiasm and offer to send a letter to the Italian scientists. You don't have Emery-Dreifuss, though your symptoms are strikingly similar, my doctor insisted, suggesting my absence of cardiac symptoms excluded such diagnosis. I told her that I sometimes sensed my heart beating oddly, like a dying fish flopping about. And sometimes when I felt dizzy, I pressed my fingers against my neck and counted beats, noting the peculiar pause of skipped beats. My doctor assured me this was perfectly normal, as did my father when I described the symptoms. "My heart used to do the very same thing when I was your age," he said. I decided to write to the Italian scientists myself to suggest my family as potential participants in their research. In a brief letter, I described my symptoms and introduced myself as a 20-year-old-college student. As I proofread the letter, I stared at the blank space following my name. No MD, no PhD. I didn't think anyone would believe me. As I prepared to seal the thin envelope, my eyes met the only thing that could prove my case. I placed a camera upon a makeshift tripod of biochemistry texts atop a table in my room, disrobed to my underwear, and set the timer on the camera. Before slipping the photo of myself in the envelope, I cut off my head with a pair of scissors and included a recent family Christmas picture. The photo included my two sisters and two brothers (three of whom are also affected with EDMD, though with wide variation in symptoms), as well as my parents and me. I continued to collect articles on Emery-Dreifuss, and a month later I sat at the family room table one evening reading them. I grew frightened by the cardiac problems associated with EDMD, so I buried the reports of patients who died unexpectedly in the bottom of the stack. Interrupted by my dad returning home from work, I didn't have time to hide them, so I slid the stack underneath a pile of worksheets from another class, and buried them in the thick pages of one of my textbooks. I remained in the kitchen just long enough to make a bag of microwave popcorn, and upon returning saw my dad clutching the articles in his hands. I attempted to take them away from him, but he pulled them closer to himself, furiously scanning the cumbersome text. "I have all of these symptoms," he insisted. "You mean the muscle problems?" "Yes, but I also have all of these heart problems described here. I've heard all these words before," he said. I was puzzled by his response. My only recollection of cardiac problems was the bulky electronic device he carried around for a day during a trip to the Mayo Clinic nearly 15 years ago. He called it his proton pack and we pretended he was a character in Ghostbusters. "They told me I had a virus and not to worry about it," he said. "You don't have a virus," I insisted. I was puzzled by what I should do next. Our frank discussion had scared me. I decide to make an appointment with my father's cardiologist, and inform him of what I'd found in the literature. Though not familiar with the cardiac problems that can accompany EDMD, after consulting the references he agreed to the implantation of a pacemaker. Around this same time I received a letter with an Italian postmark. The Pavian team had written to request our participation in their genetic study! I was convinced by this point that my family had AD-EDMD, but my physicians and family remained unpersuaded. A few weeks later, while sitting in the waiting room of my primary care physician, I pulled out my chart and scratched out the diagnosis: muscular dystrophy, unknown etiology. In big bold letters, I wrote, "AD-EDMD." "What are you doing?" my mother gasped. "I'm changing my chart," I insisted. Desperate for a confirmation, I searched through my stacks of journal articles for a physician to contact. So many were from other countries. Finally, I contacted two Boston physicians, Drs. Frederic Shapiro and Linda Specht, who'd recently collaborated on a review of EDMD cases. "I don't understand. Why can't you see a physician in your area?" queried a representative from my insurance company. I bit my lip and decided to make the trip to Boston anyway, with my family, in June of 1996. There, Drs. Specht and Shapiro finally made the diagnosis I had been waiting to hear: AD-EDMD. Now, as part of my yearly visit to the neurologist, I receive an EKG; I'm also scheduled to check in with a cardiologist every three or four years--visits that will increase in frequency once I enter my 30s. So far, I've experienced only the early symptoms of cardiomyopathy, and my doctors don't think a pacemaker is warranted. 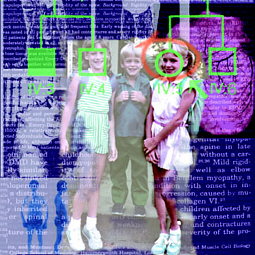 Several years after my diagnosis, the team in Italy identified the gene for AD-EDMD, confirming the AD-EDMD diagnosis for my family; the scientists' results were published in the March 1999 issue of Nature Genetics. Shortly following this exciting update, I received an inquiry from cell biologist Kathy Wilson at Johns Hopkins. She had come across my name in correspondence with a colleague and contacted me to see if my family and I wished to be analyzed as part of her research regarding the inner nuclear membrane and its role in hereditary disease (see p. 48). I inquired whether I might come join her lab as a summer volunteer. I was eager to meet the researchers behind the published papers, who were working 12-hour days in an effort to help people like me and my family. And I was hoping they'd grow to understand me, as well--not just as a research subject, but as a friend. Dr. Wilson offered me a paid internship and arranged for me to reside with two visiting colleagues, Yossef Gruenbaum and Merav Cohen from Hebrew University in Jerusalem. Michael Zastrow, a graduate student in Dr. Wilson's laboratory, served as my mentor during my stay. "I have all these articles and pictures of patients with their eyes darkened, who appear either angry or frightened or both, but it makes all the difference to talk to you face to face," he explained, gesturing to the tall stack of research articles beside him during my first day at the lab. He continued to trace the advances in EDMD research across the dry erase board but paused momentarily as he stroked his goatee. "You know all this already, don't you?" Jill Dopf is currently completing her first year of graduate study at Iowa State University. She plans to pursue a career as a writer and creative writing instructor.